EFB banner material has been designed in partnership with Flexpak as a material to replace vinyl banner. PVC banner material has many aspects that are harmful to the environment, both in production and in the post end-user. 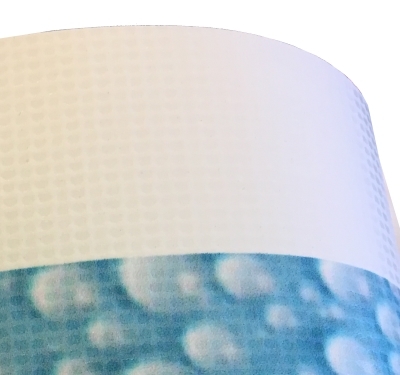 EFB material has been designed to look and feel like vinyl banner, though is 100% recyclable unlike PVC products. It is also engineered to be stronger in comparative weight. While a 12 oz vinyl outdoor banner may feel thick in its properties, the 8oz EFB material holds similar strength characteristics. RPP8 - 100% Recyclable Curbside. Outdoor Reinforced Polypropylene Banner Material that looks and feels like vinyl. Printable with UV and Latex Inks. 8 oz in weight, but stronger than reinforced vinyl of similar weights. Indoor use for longer term advertising. RPP10- 100% Recyclable Curbside. Outdoor Reinforced Polypropylene Banner Material that looks and feels like vinyl. Printable with UV and Latex Inks. 10 oz in weight, but stronger and a recommended replacement of 13-15 oz reinforced vinyls (which are not recyclable). WPP3- 100% curbside recyclable. Outdoor/Indoor use as a temporary cost-effective substrate. Printable with UV and Latex Inks. 3 oz material. WPP6- 100% curbside recyclable. Outdoor/Indoor use as a temporary cost-effective substrate. Printable with UV and Latex Inks. 6 oz material. PE- LDPE 5 mil to 7 mil material 100% curbside recyclable, and a cost-effective solution. This can also be made with percentages of recycled resin.